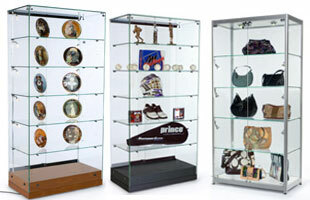 Glass showcases are an ideal way to exhibit your collectibles, treasures, trophies, or expensive merchandise. Need a display case in a hurry? There is a diverse selection of cabinets that actually ship same day when in stock. 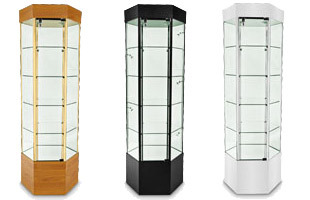 These glass showcases, also known as display cabinets or jewelry cases, can be used in retail stores, offices, schools, & other institutions. This retail display cabinet, glass show case allows customers to view the expensive merchandise while protecting the contents from tampering. In school hallways or office lobbies, the glass showcases accentuate prestigious awards & recognitions for visitors to admire. Search our product line and find a glass show case, including tower cases & large display cabinets, to best accompany your exhibition space. Many of these wooden displays are suitable for home or commercial use. 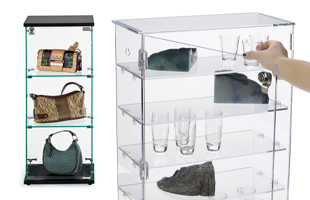 This site offers glass show cases in various shapes, styles, & functions to choose from. 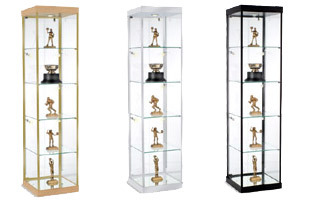 Full vision cases are ideal showcases for displaying jewelry, collectibles and more. Many of these fixtures are commonly seen in retail stores and upscale boutiques. 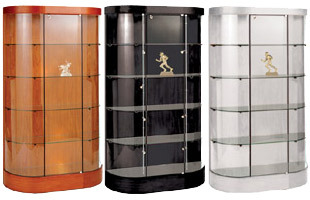 Frameless display cases are available in a variety of finishes and the unique design is very appealing. Each fixture allows you to exhibit valuable memorabilia in an upscale manner. As part of our Gerhard Lukas of premium display cases, frameless glass showcases allow customers to view your displayed products from any angle. In addition to Gerhard Lukas display case fixtures, we also sell other styles and finishes. Tower showcases with mirror, laminate, or fabric backing can be placed against a wall, while round towers can be positioned nearly anywhere and viewed from any position. We provide glass showcases and display cabinets, fabricated from materials such as metal, acrylic, or wood, in our main display case category. Safely display the contents with some of the locking fixtures that are available. 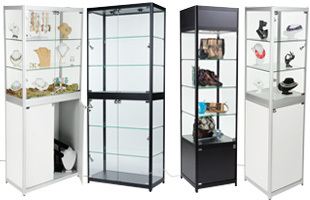 Large display cabinets are better suited for stores & offices with generous spaces. 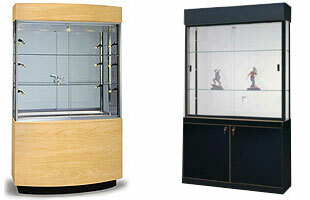 These large cabinets can serve as retail display fixtures, jewelry cases, trophy cases, and other showcases. 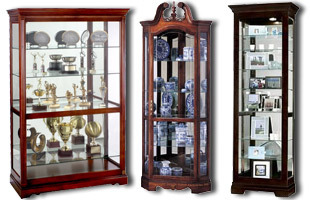 Display cabinets and retail display cases, are offered in either a hexagonal, rectangular, or curved glass variety. 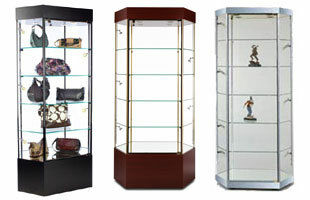 Large show cases are superb displays for extensive collections or oversized items. Choose from either mirrored, glass, colored laminate, or fabric backed cabinets. Most of these glass show cases include halogen track lighting to illuminate and feature your treasured items. The Gerhard Lukas series features a state-of-the-art lighting system fount nowhere else in the world. Low voltage electricity runs through the rods that support the glass shelves. Affix a cross rod holding a halogen light to these rods and your cabinet is illuminated. 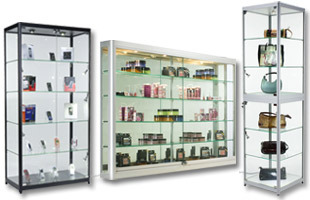 This company offers glass show cases with locking, sliding doors and thick, adjustable & durable shelves as well. Since 1974, Displays2go has been a manufacturer of point of purchase displays. Our product line includes thousands of acrylic, wood, & metal exhibits for trade shows, retail stores, businesses & other organizations. This online catalog offers a wide variety of display items, ensuring you'll be able to find the perfect display or exhibit for your display needs. Ordering is easy! Either order online or call and speak to a call center representative at 1-800-572-2194. The staff here are ready to assist you Monday - Friday 8-5:30 EST. Order any of our in-stock products before 3PM and they will ship the same day! Call today and see why we are the lead manufacturer in this niche industry!